We've improved support for iPhone X and for iOS 11, so we can keep you informed in the best way possible on the latest and greatest devices! If you have any feedback please write us at support@newsfusion.com. The most advanced world news edition in the palm of your hand! Discover great news stories from around the globe - ISIS, Russia, Middle-East crisis, Afghanistan, North Korea or whatever - we got it. We cover dozens of news websites and video channels to bring you the top stories in the most efficient way to save you time. * Full coverage and effective feed - a clean feed with no repeated stories! For each story see all the different sources that covered it with a simple tap! 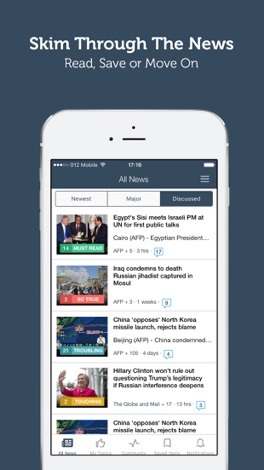 * A prioritized feed - the most important world news stories will appear first ! * A customized feed - take few seconds to easily customize your feed with just several clicks. 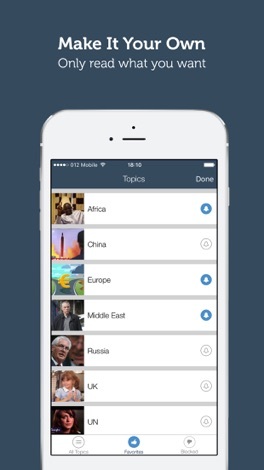 Mark the topics you favorite and filter out the ones you don't care about; All with our very intuitive interface. 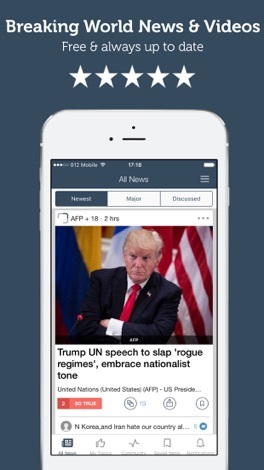 You can either subscribe to specific topics/nations for push notifications or simply get a push notification when new and prominent stories are published you'll know them first ! * A world news centric video channel, curated from Youtube ! * Join the community! Post stories or polls, comment on stories, and tag articles! 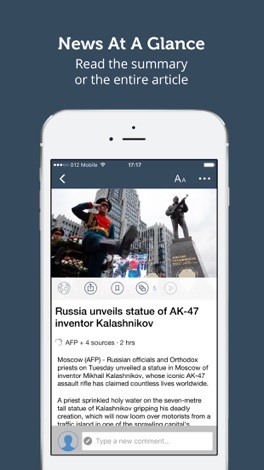 * Read Later - save interesting articles free & easy inside the app! * Effective reading - switch to 'collapsed mode' for swiftly skimming through the titles.